Clinical Canine Massage is very different to what you may perceive massage to be. Would you like to run your own Clinical Canine Massage Practice? Externally accredited by LANTRA this is the course that trains members of the Canine Massage Guild and other therapists who run their own business. We’ve been training people for over 8 years to become Clinical Canine Massage Therapists. 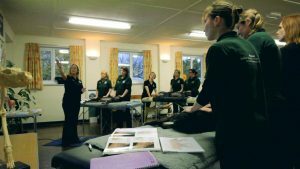 The course focuses on correct training across 4 disciplines of massage, practical and theoretical examinations, a fine working knowledge of the dogs muscular and skeletal systems as well as an awareness and an ability to assess for common orthopaedic issues, neurological implications and soft tissue injury. 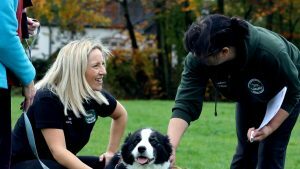 The Clinical Canine Massage Therapist will have a minimum of 2 Years training and specialise in the rehabilitation of muscular injury and Myofascial pain as well as providing pain management for the support of orthopaedic issues such as arthritis and hip dysplasia in dogs. Using the Lenton Method of Direct MFR, 4 Disciplines of Massage and over 50 techniques the practitioner has a unique skill set to aid in a dogs return to mobility and vitality using a scientific approach. Remember that only Canine Massage Guild Members are trained in this remedial massage and their proven skill set is now recognised via the Review of Minor Procedures Regime muscular skeletal group to be in the same ranking as physiotherapy, hydrotherapy and chiropractic or Mctimoney in terms of a viable therapy in the rehabilitation of an animal to comply with the Veterinary Act 1966, Exemptions Order 2015 and National Occupational Standards LANAnC61 and LANAnC62. See www.k9-massageguild.co.uk/therapistregister for professional therapists who have trained with us in the past. What Is Clinical Canine Massage Therapy? It is a Physical Therapy which integrates Canine Anatomy with a set of complex Massage Techniques to resolve muscular conditions often seen as lameness and to support Orthopaedic Issues like Arthritis and Hip Dysplasia. A therapist would also work with Sporting Dogs to help rehabilitate injury and enhance performance. The desired outcome is a dog that has improved mobility, resolution or reduction of lameness, stiffness and fatigue. A dog that is freer, supple and mobile, more able to retain their independence, have reduced pain levels and gain improved Range of Movement. It also produces phenomenal results in dogs with Orthopaedic Conditions such as Arthritis or Hip Dysplasia to address what is often debilitating Protective Muscle Splinting. Clinical Canine Massage Therapy is ideal for dogs with NSAID intolerance, Agility Athletes, Senior Dogs , those slowing down or having intermittent lameness issues and post surgical care and rehabilitation. The 7 Protocols – Importantly what really sets this course apart are the 7 Protocols; a unique set of techniques developed by Natalie Lenton over the last 10 years spent working with dogs. The 7 Protocols address deep, embedded patterns of Myofascial Restrictions which are often the cause of reduced or impaired mobility and pain. The student is taught the 7 Protocols throughout the Practical Days and is coached to develop an understanding of the theory of the Protocols and their skilled use. Body Mapping – Developed by Natalie Lenton the student will leave with a comprehensive Body Map which determines clear anatomical locations of muscular injury and issue such as Strains, Trigger Points and Myofascial Pain. The BodyMap took Natalie years to develop and Students benefit by being able to enter the field at an incredibly high level. Advanced Palpation Routine – Learn how to guide your hands over the body to detect Muscular Injury And Myofascial Dysfunction as you learn a structured way of reading the body with the Art of Informed Touch. Reading Skeletal Landmarks, Veins, Arteries, Fascia both Deep and Superficial and Muscle with the fingertips is an Advanced Skill that requires months and months or practice to become competent. The Practitioner Programme focuses heavily on developing this skill with Palpation Practice and Palpation Drills regularly in place as well as Tutor Assessment and one on one help and guidance. The Lenton Technique is the combination of the 7 Protocols, Bodymapping and a set Full Body Palpation Routine. When used adjunct to one another the Lenton Technique makes positive and consistent improvements to the dogs mobility, comfort, ability and longevity and reliably identifies areas of muscular and fascial issues in the dog which may cause or contribute to mobility issues. Guided Study Days Off Site – So you can experience what its like to work in industry as a Canine Massage Therapist we take you off site and guide you through information and technique packed days to enhance your handling skills, improve your massage skills, and meet other canine professionals. Fascinating Home Study Modules – 11 Home Study Modules give the student in depth knowledge of the dogs Anatomy and Physiology as well as Orthopaedic, Muscular and Neurological Pathologies. Gait Analysis, Massage Theory and a Business Awareness Module to help begin mentoring the student into setting up their own successful Canine Massage Practice. Canine Massage Guild – Upon a successful pass the new therapist is eligible to join the Canine Massage Guild; a UK and European Wide Network of Professional, Insured Canine Massage Therapists who have all completed the 2 Year Practitioner Programme or Diploma Equivalent. The Guild offers a referral network, Continuing Professional Development, further training and progression, partnering to do shows, client referrals, advice and updates on changes in industry legislation. How Is the Course Structured, Accredited and Assessed? This 2 year Part Time, LANTRA Awards Accredited Course delivered by the Canine Massage Therapy Centre is exhilarating and life changing for its Students. For many this will be the career change they have dreamed of; one working with dogs to help rehabilitate them from injury, provide pain management for orthopaedic conditions and senior dogs with a career that is so very rewarding in this fascinating, ever growing field. 11 Core Anatomy & Physiology Home Study Modules – These core modules prepare the student for the anatomical grounding they will need before they set foot in the classroom. The fascinating nature of the Canines Anatomy & Physiology is a complex and detailed one. Many of these modules will come in at around 5,000 words each. The Student must complete up to and including Module 9 to be able to attend Practical’s. You are given a Reading List for each module and are supplied with a Work Pack to introduce you to each subject which helps focus your studies. 12 Practical Days – Highly Intensive and very physically demanding the Practical sessions teach you the Art of Palpation, the 4 Disciplines of Massage, 50 Techniques, PROM, BodyMapping, the Lenton Method, lectures on Neurology, Orthopaedics, the Pathology of Soft Tissue Injury alongside visiting clients bringing in their dogs for massages performed by the students, off site guided study days and plenty of hands on Live Canine Anatomy and How to Market Your Business. You will have up to 4 Tutors per group making the ratio of 2.5 students to 1 Tutor an incredibly high ratio so you get the hands on help and support you need. The Externship – 10 Case Studies = After Session 6 the Student may begin Case Studies. This provides the transition from Student through to Practitioner. The Student must find their own appropriate case studies and is also given help, mentoring and support via group and one to one discussions with a tutor on their progress and reflective practice. Emphasis is on Client Self Care – The student is taught common living and environmental stresses and to go on to grow their knowledge and identify their own during the Client Consult which may be impacting on or causing issues in the dogs health and mobility. The student will be taught how to give At Home Care Plans or Maintenance Sheets to help place the responsibility of care on and empower the owner. A Supportive, Fun Learning Environment – This is no roll on roll off course. You are allocated a group and you will work within the group for the duration of your practicals. We create a positive, social atmosphere within our community of Students, Tutors, Therapist and Visiting Owners, and Students are encouraged to bring in their own valuable experiences too. Your tutors are all experienced Canine Massage Therapists and also Human Bodyworkers. The Tutors are Natalie Lenton, Helen Clarke from 3 Counties Canine Massage in the Malvern HIlls and Cath Nicoll from DogsBody Canine Massage in Gloucester. Mentoring – Our Team of Tutors help guide you through not only the massage techniques and canine handling but also coach you in delivering a thorough Client Consultation along with other methods such as Gait & Postural Analysis. We want you to the best therapist out there and this means not only developing competence and mastery with your practical skills but also mentoring you during the initial set up of your own business. Please do be aware that Canine Massage is a very physical job which can mean spending prolonged periods on the floor, standing at a table or handling dogs. If you would like to discuss the occupational hazards or elements of physical stress that are associated with being a Clinical Canine Massage Therapist before you start the course please do not hesitate to contact us. We strongly advise all prospective applicants to come along to one of our 1 day workshops to help assess for yourself whether this is the right course for you. We teach anatomy from the ground up however, it is very beneficial to have some grounding in the subject before you commence the course. Although this is not mandatory we find that alot of students want to do something in between applying to enrolment to prepare for the course. It’s not mandatory but some people ask if there is a course that may help them prepare and we recommend this short online dog anatomy course with the Open College to those applicants who have no experience of anatomy and physiology, to help prepare them for the course. If you state that you are applying to study with Canine Massage Therapy Centre then you will be eligible for a discount. 2. Complete the SELF ASSESSMENT and email back to admin@k9-massage.co.uk We will endeavour to confirm receipt of your email. 4. You will be contacted by Email and sent a Pre Interview Qualifier; a small amount of written work that asks you to further research about massage and its benefits. You submit this and an telephone interview is arranged. 5. Your friendly phone interview will take place as arranged by email. 6. Acceptance on the course will be followed by full enrolment forms being sent by email. 7. Send us your enrolment forms back by post. 8. You begin the Home Study Modules in Winter 2019/ Jan 2020 and your practical session dates will commence April 2021. 9. The level of written work is 1st/2nd year Degree Level. You should like to study, be interested in Anatomy and like to do assignments. 10. This is not a `roll on roll off` course. It is 2 years on intense studying and training in Anatomy & Physiology as well as many hours of practical training both in and out of the classroom. It is not a full time course but requires you to do research and written modules. Our students must have completed up to and including Module 9 before attending any pratical sessions. 11. Please Note: The training is physically intense and you will spend hours on the floor and stood at a table with the dogs on practical weekends. We ask you politely to be as honest with yourself as possible about whether you are able to do this as we feel it is our ethical responsibility to you to make you aware of this. 12. It is highly advisable to attend a canine massage workshop with us before enrolling on the course. Student will also be required to buy their own books from the Reading List, a Massage Couch and a Student T Shirt.